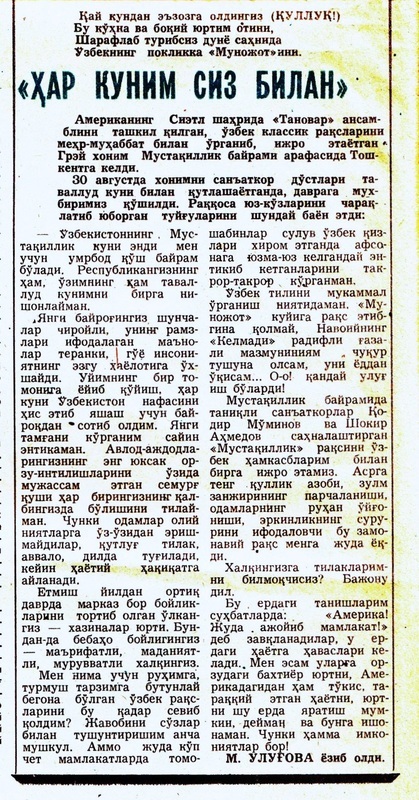 historic Seattle Soviet Theatre Arts Exchange which presented concerts at venues throughout Tashkent; in 1990, she coordinated the West Coast tour of the Uzbekistan Dance Company. In 1994, Gray established the annual Central Asian Dance Camp, offering classes in Uzbek dance technique and choreography to participants from the United States and Canada. After her move to the Washington DC area, Dr. Gray founded the awarded winning Silk Road Dance Company in 1995. She often draws on Central Asian traditions to create concert programs celebrating the historical and cultural heritage of the Uzbek people. In 2001, her work Remembering the Legends: 3,000 years of Women on the Silk Road, premiered at the John F. Kennedy Center for the Performing Arts. More recently, The Golden Road to Samarkand marked the 2750th anniversary of the founding of Samarkand. 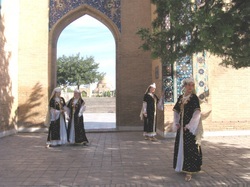 In June of 2007, Gray chose the theme of Babur's Legacy: Exploring Uzbek-Indian Connections for the 11th Annual Central Asian Dance Camp. The undertaking combined dance classes and a concert featuring Uzbek and Indian artists as well as the Silk Road Dance Company. Australia. She has included instruction in Uzbek dance in her university course, "Dances of the Islamic World," which has been offered at both George Washington University and George Mason University. Her articles have been included in the Oxford University Press International Encyclopedia of Dance, the World Encyclopedia of Contemporary Theatre, Encyclopedia of Women in Islamic Culture, and the Encyclopedia of Modern Asia. She has written for many dance publications and her work has appeared in French-Canadian, German, Russian, Finnish, and Uzbek magazines and newspapers. activities documented by UNESCO this year, the Fifth International Oriental Music Festival, was held in Samarkand, Uzbekistan last August. 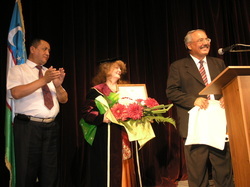 Twenty-five countries participated, and Egypt won a prize. The festival witnessed a national competition between the artistic teams who presented shows of the history, civilization, and art of their countries, characterized by spice, delight, splendor, and more than that, the spectacle of those shows taking place in Registan Square, which holds historical Islamic architectural marvels. Except that the shows and performances of the American Silk Road Dance Company dazzled the eyes and excited the hands with warm applause; they won intense admiration for their distinction in presenting dancing tableaux in gorgeous Oriental costumes and disciplined performance indicating expertise in comprehending and digesting Islamic history and art. They had us reliving the era of the Thousand and One Nights! The secret of the attention on this dance company is that it's American, grown up on Western art and its various instruments away from Eastern art, but nevertheless by its delightful performances it has proved a match for the masters in Uzbekistan, wearing costumes ornamented in beautiful colors that express the various nationalities of the region. By this performance the Silk Road Dance Company was able to attract the attention of the judging committee and the audience, who praised the fine rendition accompanied with Eastern melodies and ensemble dancing. They presented living tableaux interpreting glimpses of traditional culture that is still practiced among peoples at occasions and celebrations like the spring holiday, the harvest festival, wedding feasts, and the like. 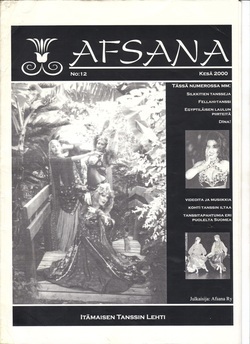 company performing Uzbek, Oriental, and even Egyptian shows. It was clear that this performance by the Silk Road Dance Company is not limited to international festivals alone. They have appeared in Egypt and presented amazing Pharoanic tableaux using costumes and accessories in scenes that bring to life the legend of Pharoanic art, overflowing with beauty and magic. The art did not repeat an improvisatory performance. This company that is famous in America and Europe has a renowned academy of Oriental art and ancient arts that have nearly fallen into oblivion. The artist studies all the tools and elements of performance theoretically and practically, and thus scores successes that exceed all expectations in Egypt and Uzbekistan, and even in the United States of America that have made her an ambassador between civilizations and cultures, and a living element that conjures up the colors and arts of Pharoanic and Islamic Oriental civilization, inside the United States and abroad. au bout de ses rêves. "Seven Beauties" --performed by the Silk Road Dance Company. Paykar: The Seven Beauties which premiered on Saturday, April 2, 2005 at the Publick Playhouse in Cheverly, Maryland as the cornerstone of the Third Annual World Dance Showcase "Dancing in Islamic Lands”, presented by the Maryland-National Capital Park and Planning Commission. pavilion of a different colour for each princess, visits them on the seven days of the week in order, and dresses himself in the appropriate colour for each visit. handed down from Shambhu Maharaj through Bandana Sen of Calcutta to disciple Jayantee Paine, who supervised the performance of her student Monica Ullaggadi. The performance was delicate and reminiscent of old black-and-white films such as Jaalsagar and Pakeezah. embroidered suzenai to the King, who was shading himself with a green parasol. 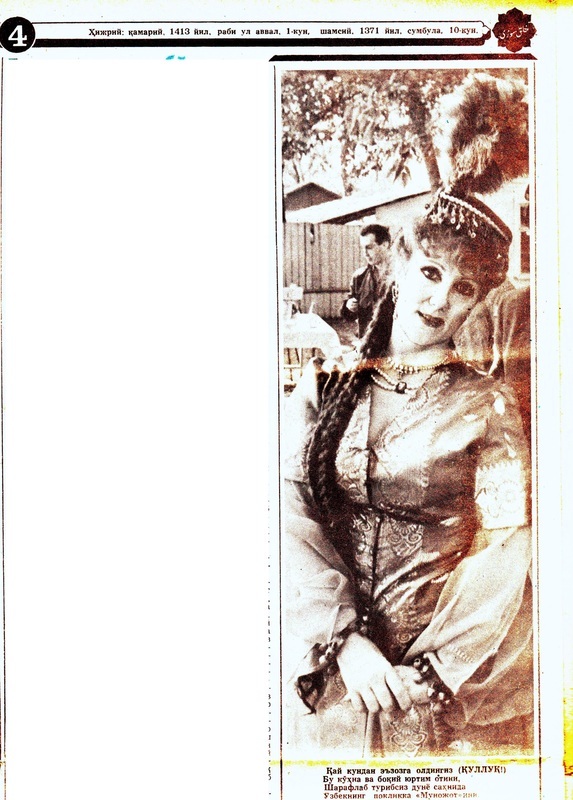 Suddenly they dropped the tapestry to reveal the Kharazm Princess, performed by Cindy Connelly Ryan. This princess represents Faith, and, in a manner reminiscent of Kuchipudi dancers, performed her entire dance on a large embossed brass tray. The Kharazm dancers wear belled bracelets on their wrists and shiver them constantly to accompany their bird-like movements. The authenticity of this choreography was evident; it was taught to Silk Road Dance Company members by Qizlarhon Dustmuhamedova, People’s Artist of Uzbekistan. Laurel V. Gray’s ability to draw together such collaborators as Paine and Dustmuhamedova has made this composition impressive in its authenticity. battle with this fierce princess, to learn the virtue of Passion. Muslim declaration of faith. As such, it was performed with suitable reverenceand was well-received by the diverse audience. and bowed regally to the ovation of the packed auditorium. Laurel Victoria Gray is to be commended for her spectacular concept, and the members of her company for bringing a poetic fantasy to life. The imposing set pieces, designed and executed by Evgenia Luzhina-Salazar, and the intricate lighting design by Publick Playhouse Technical Director Cheryl Lee, worked together in perfect harmony to suggest the architecture of miniature paintings and the signature colour spectrum so essential to the vision of Nezami. Although other dance companies may have attempted this ballet in the past, the Silk Road Dance Company’s production must be counted as the most faithful rendition of the literary classic Haft Paykar. "I Devote My Dance to Peace"
and Laurel Victoria Gray's Seattle-based ensemble, Tanavar.